The International CES 2015 saw the big names in the camera industry unveil several new models, apart from seeing a rise in another photography trend - drone-based photography and extreme sports photography. Numerous small manufacturers showed off their drone-ware at CES 2015, but of course one name stood out amongst the lot, and that was Intel, with an autonomous flying drone capable of navigating around obstacles. 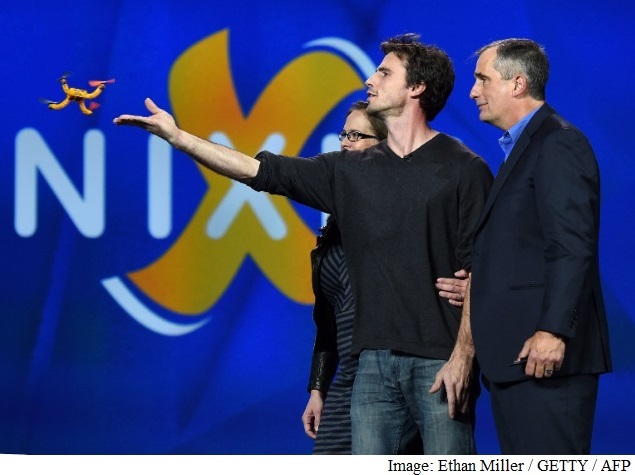 Intel CEO Brian Krzanich also showed a smaller drone worn on the wrist until it is launched into the air. Called Nixie, the camera-equipped gadget in November won a wearable computing contest sponsored by Intel, and also stole the show at CES. Coming to the major camera manufacturers, Nikon launched its first touchscreen DSLR, the D5500, which features a 3.2-inch Vari-angle LCD monitor with a touchscreen. Nikon was quite late to this party and the Canon's Rebel line of DSLRs have had touchscreens since 2012. The D5500 has a 24.2-megapixel CMOS sensor, already seen in the D5300 launched last year. It has the proprietary EXPEED 4 image processing engine. The D5500 doesn't have a low-pass filter, also known as the 'anti-aliasing' or 'blur' filter in layman terms, just like its predecessor. The Nikon D5500 is expected to be available in early February in India, in black and red, in three different kit configurations: alongside the AF-S DX NIKKOR 18-55mm f/3.5-5.6G VR II lens for Rs. 59,950, with the AF-S DX NIKKOR 18-140mm f/3.5-5.6G ED VR lens for Rs. 72,950, and with AF-S DX VR 18-55/3.5-5.6G VR II and AF-S DX 55-200/4-5.6G ED VR II for Rs. 68,950. 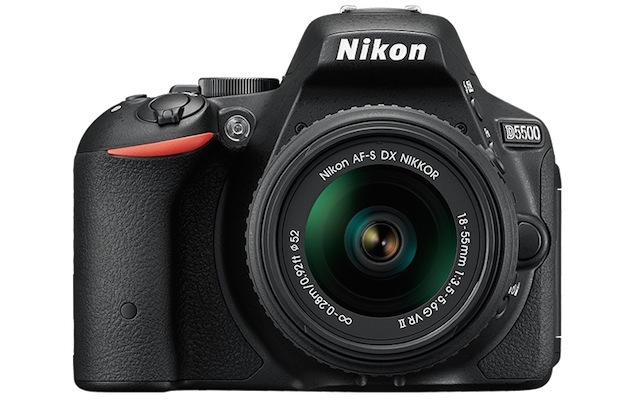 The Nikon D5500 will also be sold body only for Rs. 54,450. Panasonic pulled the wraps off new cameras in the following ranges: Lumix SZ (compact), Lumix TS (rugged), Lumix ZS (travel). Also, Panasonic has introduced new 4K and Full-HD (FHD) camcorders. The Lumix SZ10, which is a compact camera focused at the current crop of selfie addicts. Thanks primarily to the 2.7-inch 460K-dot LCD monitor can tilt up by 180-degrees. It also has a 24mm wide angle lens to fit in more people in the same frame. There are a few beauty effects like Soft Skin, Slimming and Defocusing on offer. The Lumix TS6 and the Lumix TS30 are the two new rugged cameras. The camera is waterproof to 43 feet, shockproof to 6.6 feet, freeze-proof to 14 degrees F, pressure resistant to 220 lbf, and dustproof. The Lumix TS6 and the Lumix TS30 will be available at $299 (approximately Rs. 18,900) and $179 (approximately Rs. 11,300), respectively. The Lumix ZS line also gets new additions in the form of the Lumix ZS50 and the Lumix ZS45. The former has a 12.1-megapixel 24mm wide-angle lens with 30x optical zoom. The intelligent zoom can extend the zoom function to 60x, albeit using software algorithms. Moving to a different category, camcorders, Panasonic has added three models to its range of full-HD camcorders - the HC-W570, HC-V270, and HC-V160. All three models are equipped with a 2.2 megapixel back-illuminated sensor (BSI). Except the V160, which has a 32.3mm wide angle lens, the other two camcorders have a 28mm wide angle lens. The HC-W570 and HC-V270 models boast of 50x optical zoom lenses, whereas the HC-V160 has a 38x optical zoom lens. Also, the HC-W570 and HC-V270 feature five-axis HYBRID OIS+. Similarly, Panasonic added the HC-WX970, HC-VX870, and HC-V770 to its range of high-end consumer camcorders. When they hit the markets, the HC-WX970, HC-VX870, and HC-V770 can be picked up at $999 (approximately Rs. 63,100), $899 (approximately Rs. 56,900) and $599 (approximately Rs. 37,900) each. 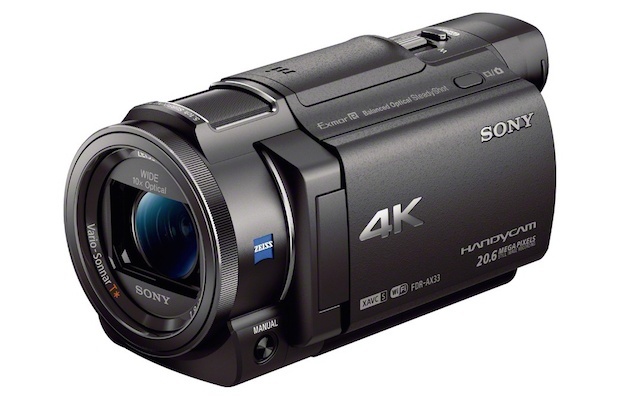 Sony pulled the wraps off the FDR-AX33, which the company claims is its 'most compact 4K Handycam camcorder to date'. It undercuts the size and weight of last years FDR-AX100 4K camcorder by 30 percent and 20 percent, respectively. It will be available from February for a price of $999 (approximately Rs. 63,200). Sony has also extended its Handycam lineup to include four new full-HD camcorders - HDR-PJ670, HDR-PJ440, HDR-CX440 and HDR-CX405. All the cameras can shoot 1080p XAVC S 50Mbps high-bitrate video, and feature either B.O.SS or Optical SteadyShot with Intelligent Active mode. All the cameras will be available sometime later this month. The HDR-PJ670, HDR-PJ440, HDR-CX440 and HDR-CX405 will be available for $700 (approximately Rs. 44,300), $400 (approximately Rs. 25,300), $300 (approximately Rs. 19,000) and $230 (approximately Rs. 14,600) respectively. Keep watching this space for India price and availability. Sony also unveiled the FDR-X1000V Action Cam. It has the capability to record 4K (3840x2160 pixels) video at 30fps (frames per second). The Japanese tech giant also showcased the AS200V Action Cam, which is not as expensive as the FDR-X1000V because it drops the 4K video recording capability for a lower maximum capture resolution of FHD (1080p). The Sony FDR-X1000V Action Cam can also shoot 1080p video at 120 frames per second or 720p video at 240fps for slow motion effects. The FDR-X1000V can play the captured videos directly on a 4K TV using an HDMI cable. It also includes a 170-degree wide-angle lens, a back-illuminated Exmor R CMOS sensor, and Sony's Bionz X image processor. Interestingly, Sony also includes the full pixel readout technology from its higher-end interchangeable lens cameras on this Action Cam, which means that one can expect better image quality. The Sony FDR-X1000V is expected to retail for $499 (approximately Rs. 31,615). A live view remote costs $100 (approximately Rs. 6,333) more. The AS200V on the other hand will cost $299 (approximately Rs. 18,945). 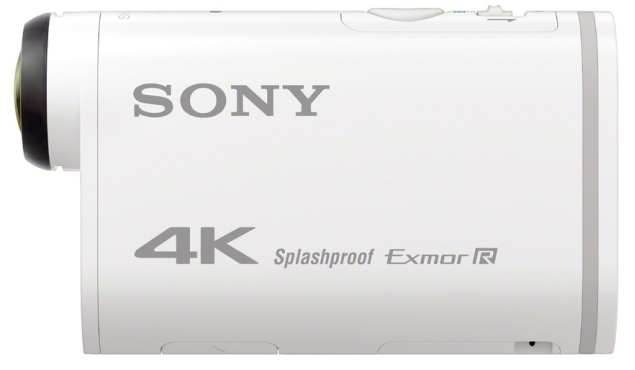 Both Sony video cameras will be available from March. Canon launched as many as eight cameras, which included three cameras to the PowerShot SX series, two in the PowerShot ELPH line and three handycams to its range of VIXIA video cameras. 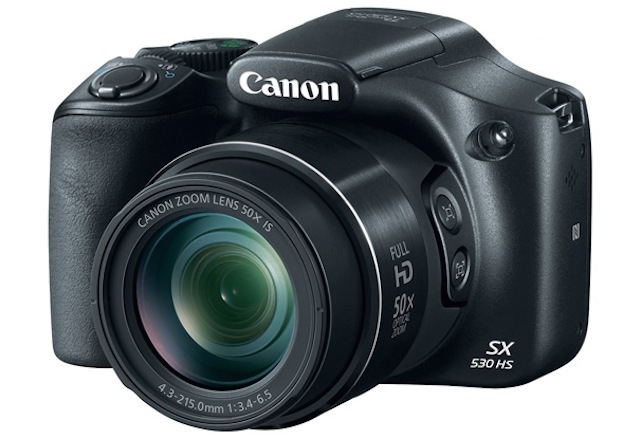 From the lot, the PowerShot SX530HS is Canon's major launch. The other cameras launched in the PowerShot SX range includes the PowerShot SX710 HS and PowerShot SX610 HS, with 30x and 18x optical zoom lenses respectively. All the aforementioned cameras have Wi-Fi and NFC connectivity. The PowerShot SX530HS, PowerShot SX710 HS and PowerShot SX610 HS are expected to have a market price of $430 (approximately Rs. 25,500), $350 (approximately Rs. 22,200) and $250 (approximately Rs. 15,800), respectively. Canon also pulled the wraps off two cameras in its more affordable PowerShot ELPH line. The PowerShot ELPH 170 IS and the PowerShot ELPH 160 are the two new additions and both of them have same features which include a 20-megapixel CCD sensor. The only differentiating factor is that the ELPH 170 IS has optical image stabilisation built-in. The PowerShot ELPH 170 IS and the PowerShot ELPH 160 have a retail price tag of $150 (approximately Rs. 9,510) and $120 (approximately Rs. 7,610) respectively. In addition to digital cameras, Canon also introduced the VIXIA HF R62, VIXIA R60 and VIXIA HFR600 handycams. Except for the VIXIA HFR600, the other two cameras have Wi-Fi and NFC connectivity. The VIXIA HF R62, VIXIA R60 and VIXIA HFR600 are expected to be available for a market price of $450 (approximately Rs. 28,530), $400 (approximately Rs. 25,350) and $300 (approximately Rs. 19,000), respectively. Canon also launched a new $100 (approximately Rs. 6,340) Pixma photo printer - the MX492. Canon says it can shoot out colour prints at 4.4 pages per minute and has built-in Wi-Fi. Moreover, Canon finally unveiled the Cross Media Station, a media hub it has been teasing for sometime now. 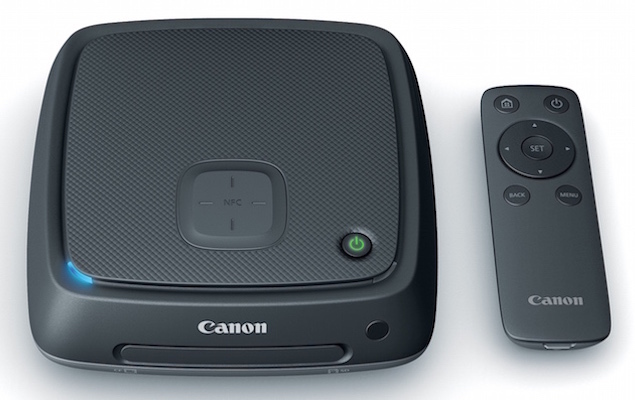 The Canon Cross Media Station is expected to be available in June this year for $299 (approximately Rs. 19,000).